The twisted beads come in 4 sizes and the smaller beads are also colored with epoxy paint. The beader can use them in magnetic wraps, or magnetic bracelets and necklaces. 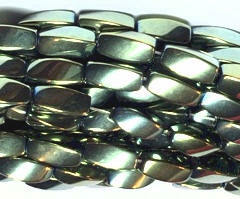 For magnetic bracelets, we recommend using a high strength 8 MM clasp to keep from falling off unexpectedly. Shipping is $7.00 for 3 day Priority Mail, for all quantities below. If you are ordering different types of supplies and the final total price shows more than $12.00 for shipping, you will receive a refund when we process the order. The refund will be sent at a later time when we process the order, which usually the same day. These 5x8 MM Twisted Beads are Blue in color and come in 16 inch long strings priced @ $3.90 each in the wholesale quantities listed below. These beads are not epoxy coated like other colored beads. They are a new technology electroplating the color onto the beads. The holes are not restricted because of the plating and they do not chip easily like the epoxy painted beads. Shipping is $7.00 for 3 day Priority Mail, for all quantities below. If you are ordering different types of supplies and the final total price shows more than $12 for shipping, you will receive a refund when we process the order. The refund will be sent at a later time when we process the order, which usually the same day. These 5x11 MM Twisted Beads are Blue in color and come in 16 inch long strings priced @ $3.90 each in the wholesale quantities listed below. These beads are not epoxy coated like other colored beads. They are a new technology electroplating the color onto the beads. The holes are not restricted because of the plating and they do not chip easily like the epoxy painted beads. 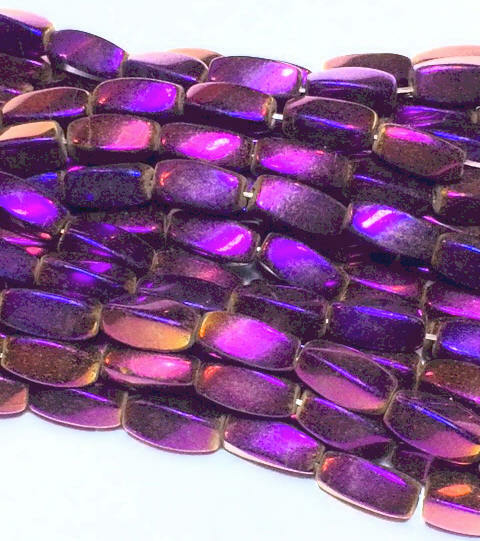 These 5x11 MM Twisted Beads are Titanium plated with a rich purple color and come in 16 inch long strings priced @ $3.90 each in the wholesale quantities listed below. These new beads are titanium plated and chip resistant. These 5x11 MM Twisted Beads are Titanium plated with a light olive tinge in color and come in 16 inch long strings priced @ $3.90 each in the wholesale quantities listed below. These new beads are titanium plated and chip resistant. These 5x11 MM Twisted Beads are Titanium plated with a light olive tinge in color and come in 16 inch long strings priced @ $3.90 each in the wholesale quantities listed below. These new beads are real silver plated and chip resistant. These 6 MM Blue epoxy coated magnetic beads come in strings 16 inches long with about 67 beads and priced @ $3.90 each in the wholesale quantities listed below. Shipping is $7.00 for 3 day Priority Mail, for all quantities below. If you are ordering different types of supplies and the final total price shows more than $14.00 for shipping, you will receive a refund when we process the order. The refund will be sent at a later time when we process the order, which usually the same day. These 6 MM Lavender epoxy coated magnetic beads come in strings 16 inches long with about 67 beads and priced @ $3.90 each in the wholesale quantities listed below. These 6 MM silver epoxy coated magnetic beads come in strings 16 inches long with about 67 beads and priced @ $3.90 each in the wholesale quantities listed below. These 4 MM pearlized epoxy coated magnetic beads come in 16 inch strings. Current shipment is 32 inches long with about 220 beads and priced @ $3.90 per 16 inch string length in the wholesale quantities listed below. These 6 MM pearlized epoxy coated magnetic beads come in strings 16 inches long with about 67 beads and priced @ $3.90 each in the wholesale quantities listed below. These beads are strung on 32 inch line or 2 strings to a package. These beads have a little bit of a silver tinge to the pearl color. These 8 MM pearlized epoxy coated magnetic beads come in strings 16 inches long with about 56 beads and priced @ $3.90 each in the wholesale quantities listed below. The beads are strung on 32 inch line, or 2 strings to a package. These beads have a little bit of a silver tinge to the pearl color. Shipping is $7.00 or $12.00 for 3 day Priority Mail, for all quantities below. If you are ordering different types of supplies and the final total price shows more than $12.00 for shipping, you will receive a refund when we process the order. The refund will be sent at a later time when we process the order, which usually the same day.